It would be easy for Mike Doughty, former front man of the alternative rock band Soul Coughing, to phone in a slick and formulaic memoir of addiction and recovery. He’d start with a public moment of crisis, rewind to memories of a painful childhood, trudge warily through early experimentation with drugs and alcohol, depict a series of increasingly bizarre episodes of chemically induced celebrity misbehavior, sink lower and lower until the only options are death or rehab, then come out the other end bright-eyed, bushy-tailed, and happy as hell to be clean and sober. It’s a fairy tale we’re all too familiar with, and Mr. Doughty has the good sense not to insult us with it. Instead, he opts for a more organic approach to telling his story, effectively scattering a handful of narrative seeds to the wind and letting them blossom wherever they land. The result is a fascinating read that’s as much a chronicle of the music industry in the waning days of the 20th century as it is a story of addiction and recovery. Among other things, The Book of Drugs offers an inside glimpse of what the music industry looked like before DSL and file-sharing services like Napster rendered it a dinosaur: big, bloated, and curiously naive. Indeed, as Mr. Doughty describes the industry’s early attempts at harnessing the power of the internet by signing musicians up for AOL accounts, it’s hard not chuckle—music industry, meet the internet. Oh, and by the way, prepare to die. What makes this memoir so moving is the author’s unabashed honesty about his artistic and personal insecurities. Touring with a band that consisted of musicians who were older, more seasoned, and better trained than himself, Mr. Doughty, it turns out, was wracked with self-doubt that frequently spiraled into interminable spells of self-loathing. 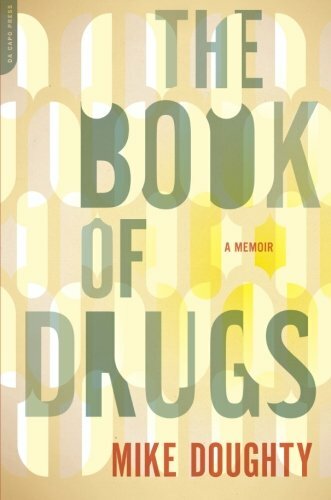 In this sense, The Book of Drugs offers an intimate portrait of a tortured artist as a young man. Miraculously, however, there isn’t an ounce of self-pity in the book. Instead, Mr. Doughty proceeds with a healthy mix of objectivity and irony. As a narrator, he’s watching his younger self from a distance, commenting occasionally on the proceedings and offering analysis wherever he can, but mostly just painting a portrait of the life he used to live. For better or for worse, he seems to intone on every page, this is who I am, and this is how I got here. In many ways, Mr. Doughty’s writing reads like a kind of textual free jazz, a series of improvised anecdotes and vignettes that alternate between building upon each other, screeching to abrupt halts, and cutting each other off practically midsentence before resolving into a complex, textured, and satisfying if sometimes jarring harmony. One result of this writing style is that as a character Mr. Doughty comes off as a kindred spirit to Billy Pilgrim, the “unstuck in time” protagonist of Kurt Vonnegut’s Slaughterhouse Five. Like Billy, Mr. Doughty is at the mercy of forces far beyond his control—not imaginary time-traveling aliens or the machinations of war, but the equally bizarre phenomena of mercurial record industry executives, observably sociopathic band mates, and a ceaseless, gnawing sense of self-doubt. What separates Mr. Doughty from Billy Pilgrim, however, is the former’s perspicacity. The narrator tells his story at a good decade’s remove from the events that nearly killed him. Thus, even as the narrative speeds along and frequently threatens to skid off the tracks, Mr. Doughty remains thoroughly in control of the proceedings. The result is a satisfying, moving, and at times hilarious study of drug addiction, the music industry, and, above all, the cacophonous jangle of bizarre and often contradictory impulses that define the human condition.